The ceremonious event will be held in Chillicothe at Yoctangee Park at the Big Lion’s Shelter (shown on the map). A traditional Native American harvest ceremony is scheduled in August to bring together local descendants of native tribes and give thanks to Creator for this year’s crop harvest. The Saponi-Catawba Nation will hold an event Aug. 5 at 11 a.m. for the celebration of the Green Corn Harvest Festival in Chillicothe. The festival will be held at Yoctangee Park at the Big Lion’s Shelter. Chief Rick Haithcock of the Saponi-Catawba Nation invites current members and the public to attend the ceremony. “Casual attire is welcome,” said Haithcock. The event will last for several hours and end in the evening, depending on how long people want to talk, but is expected to wrap up around 5 p.m.
“We are going to have ceremony, food, drumming and dancing. We ask everybody to bring their favorite corn, bean or squash, or buffet dish,” said Haithcock. Corn, bean and squash are known as the “Three Sisters” and relegated as important staple crops in the food diets of indigenous peoples — an important tradition Haithcock wants to continue. Sister tribes, including members of the Saponi Nation of Ohio and the Tutelo Nahyssan and the Catawba Tribe of Carrs Run, are invited and encouraged to attend the ceremonious event. Haithcock, who now resides in Grove City with his wife Debra Ann, graduated from Washington City Schools in 1976. He was a member of the US Army, the US Navy, and the Pennsylvania US Army National Guard. He attended Wilmington College and Millersville University in Pennsylvania and has spoken about the history and culture of the Saponi Nation at several organizations and institutions, including the University of North Carolina at Pembroke, the Anthony J. Celebrezze Federal Building in Cleveland, and the Dayton Veteran’s Administration. There are about 300 members of the Saponi-Catawba Nation, said Haithcock, with many members of the Saponi-Catawba Nation living currently in Fayette and other southern Ohio counties. “We want to invite them out and we want to re-acquaint them with our traditional ways,” said Haithcock. Haithcock said local families who have Saponi-Catawba Nation membership or may be descendants include Haithcock, Johns, Mitchell, Richardson, Locklear, Hedgepeth, Keel, Kells, Evans, Pettiford, Harris, Findley, Collins, Bowling, Sizemore, Blevins, Hart, Simmons, and numerous other family surnames in the area. “We want people from Washington Court House, Bloomingburg and Jeffersonville, and surrounding communities to come out to the celebration,” said Haithcock. Descendants are eligible for membership, said Haithcock, and the Saponi-Catawba Nation is continuing to enroll members as they become aware. For information on Saponi-Catawba Nation membership, call Haithcock on his cell phone and leave a message at 937-532-4676. “They can always call and ask and I can let them know. I have 56 books in the Library of Congress on Native Americans east of the Mississippi. I can tell them if they’re our people or not. I’ve been doing this for years and this is something I love doing,” said Haithcock. The Saponi-Catawba Nation holds monthly and a quarterly council meetings. 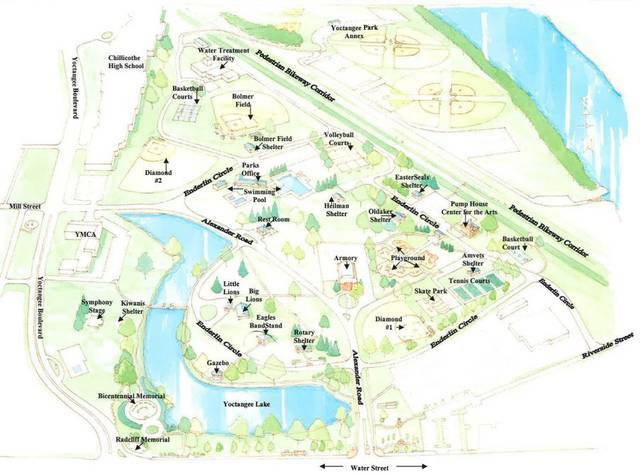 https://www.recordherald.com/wp-content/uploads/sites/27/2017/07/web1_ParkChillicothe1.jpgThe ceremonious event will be held in Chillicothe at Yoctangee Park at the Big Lion’s Shelter (shown on the map).